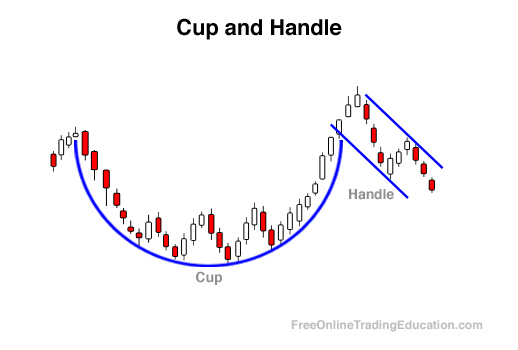 A Cup and Handle pattern is formed after a pullback from a swing high rallies back strongly to the prior swing high and stalls due to overhead resistance. The price action then stalls much like a bull flag with slight downward pressure before breaking out of overhead resistance. The power of a Cup and Handle lies in the fact that after hitting overhead resistance from the prior swing high, a very minor correction is put in. The stock then breaks out past resistance which can be a sign that demand for the security may be increasing. Cup and Handle patterns can be stronger when the next logical place of resistance on the chart after the breakout is a considerable distance away. Technical analysts often use Cup and Handle patterns as buying opportunities because of their ability to "prove" the lack of selling pressure during the timeframe being assessed.